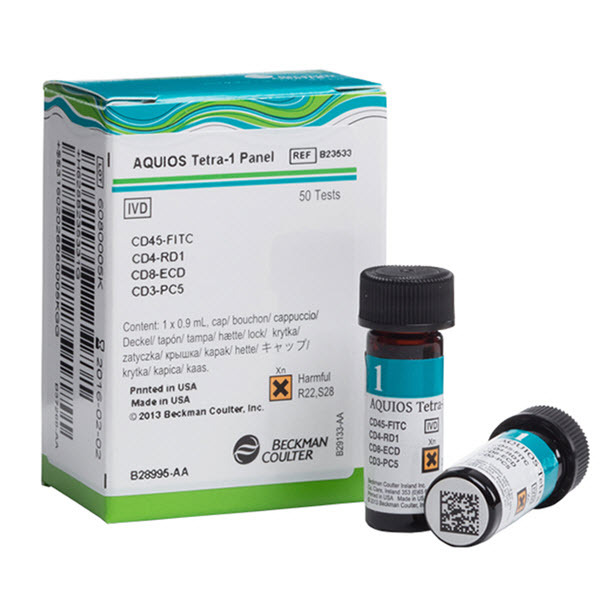 AQUIOS Tetra-1 Panel Monoclonal Antibody Reagents is a four-color monoclonal antibody cocktail consisting of CD45-FITC/CD4-RD1/CD8-ECD/CD3-PC5, and is used in the identification and enumeration of total CD3+, CD3+CD4+, CD3+CD8+, CD3+CD4+/CD3+CD8+ (ratio only) lymphocyte percentages and absolute counts in peripheral whole blood, plus the CD45+ absolute count and CD45+ Low SS (lymphocytes) percentage and absolute count. The formulation is optimized for high performance on the AQUIOS Flow Cytometer system: no experimenting, mixing or other pre-analysis work is necessary. The AQUIOS Tetra-1 Panel is ready to use. AQUIOS monoclonal reagent vials are cap pierce-able so there is no need to uncap and recap the vials every day. The vials are barcoded , which allows the user to load the vials in any random position. LOAD the vial in the carousel onboard the system, and GO. The system does the rest. High volume laboratories may load multiple vials in the reagent carousel and the system will automatically detect their presence and move from one vial to the next as needed.